Ruby and Simon are twins, and before they moved to the middle of nowhere, they were close. Now though they have slowly grown apart. That is until some startling news is brought to them. Apparently Simon is a Storm Maker, able to control the weather. Ruby can't even believe that such a thing is possible, but after all the weird things that had been happening it makes a strange sort of sense. There are others like them; other who use their powers to help save lives and others who only want to do harm. Ruby tries to help Simon figure out who they can trust, but they have to trust each other first. The twins might be more valuable than they could have ever imagined. This was a cute action story about some sweet superpowers. I would love to be able to control the weather. The story remind me of an MG version of the The Avengers (1998), maybe a little less action-y though. Weather is a very fascinating power that is so unpredictable and effects people so much. I think this book could have been a bit shorter for the audience it is meant for. It just seemed like the beginning was a bit drawn out. I liked how even though Ruby and Simon were twins, we met them at a point where they weren't so similar. Simon is more a physical person, where as Ruby is very bookish and brainy. I am always one to enjoy a good villain and this book presented one nicely. I appreciated that in the beginning it was mildy tricky to decide who was trust-worthy. It was made quite obvious at one point, so there wasn't much wonder. There was a surprise twist near the end, but it seemed to me a pretty obvious thing, so it wasn't too surprising, whereas another one was. (Did that make sense? *shrugs*) Anyways. 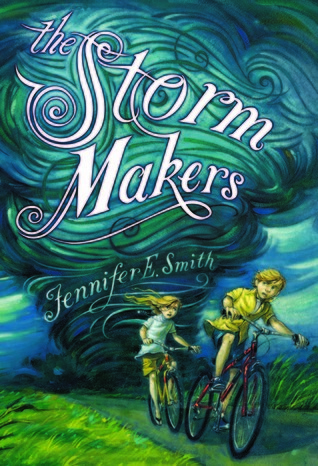 This was a cut book and I recommend you check it out if you like Middle Grade stories and weather. "Only Ruby knew about the stranger in the barn." "Ruby watched the back of his gray coat as he walked away." Thanks for the review. I hadn't heard of this one. I want to read some more MG. Sounds cute enough. I like the idea of controlling weather too.